Forex Gap Strategy — is an interesting trading system that utilizes one of the most disturbing phenomena of the Forex market — a weekly gap between the last Friday's close price and the current Monday's open price. The gap itself takes its origin in the fact that the interbank currency market continues to react on the fundamental news during the weekend, opening on Monday at the level with the most liquidity. The offered strategy is based on the assumption that the gap is a result of speculations and the excess volatility, thus a position in the opposite direction should probably become profitable after a few days. Regular trading with clear rules. No stop-loss hunting or premature hits. You have to open position at the week's beginning and close it right before the end. Select a currency pair with a relatively high level of volatility. I recommend GBP/JPY as it showed the best results during my tests. But other JPY-based pairs should work too. By the way, it's a good strategy to use on all major currency pairs at the same time. When a new week starts look if there is a gap. A gap should be at least 5 times the average spread for the pair. Otherwise it can't be considered a real signal. If Monday's (or late Sunday's if you trade from North or South America) open is below the Friday's (or early Saturday if you trade from Oceania or Eastern Asia) close the gap is negative and you should open a Long position. If Monday's open is above the Friday's close the gap is positive and you should open a Short position. Don't set a stop-loss or a take-profit level (it's a rare occasion but stop-loss isn't recommended in this strategy). Right before the end of the weekly trading session (e.g., 5 minutes before the end) you need to close the position. 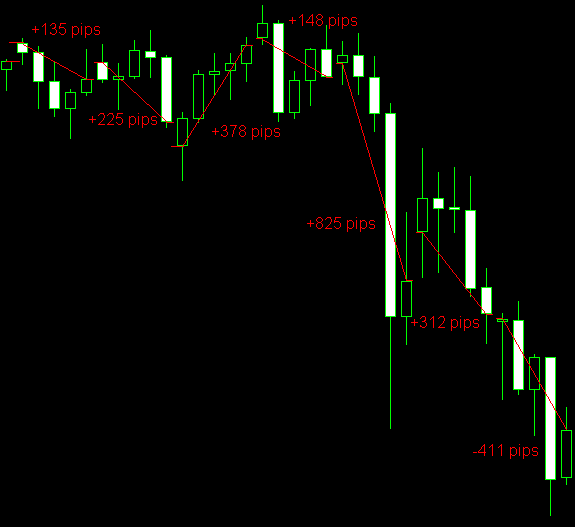 You can see GBP/JPY pair's last 7 weeks (as of May 24, 2010) and all of them have gaps. 6 out of 7 gaps give correct signals that result in a lot of profit. The last gap gives a wrong signal and yields a medium loss. The average spread for GBP/JPY was 3 pips during the example period and all gaps were much wider than 15 pips, making them all qualifying signals. The net total profit was 1,612 pips in 7 weeks — not that bad.